The Dickenson Lodge is a great place for youth groups, churches, and family retreats. The lodge’s upper level consists of a large heated kitchen and serving area as well as two meeting/dining rooms that each hold between 40-60 people. The outer porch is equipped with rocking-chairs for your leisure and provides a scenic view of camp. The lower level of the lodge sleeps 33 using a combination of bunk beds and twin beds and is fully equipped with separate bathrooms and showers. This cabin is just up the hill from the Dickenson Lodge. It is separated into two different parts, each sleeping 18 in bunk beds and each fully equipped with bathrooms and showers. Our two newest cabins, Cabins 1&2, are located directly below the Dickenson Lodge and are connected by a short trail. Both cabins sleep 17 in bunk beds and come fully equipped with showers and bathrooms. The Pool Pavilion, our largest pavilion, can hold 100 people. It is located beside our pool and has a paved basketball court connected to it. The pavilion houses numerous picnic tables that have to the ability to fold into benches to suit your needs as well as a fire place that can be stocked with wood upon your request. Restrooms are located around the back side of the pavilion near the pool. 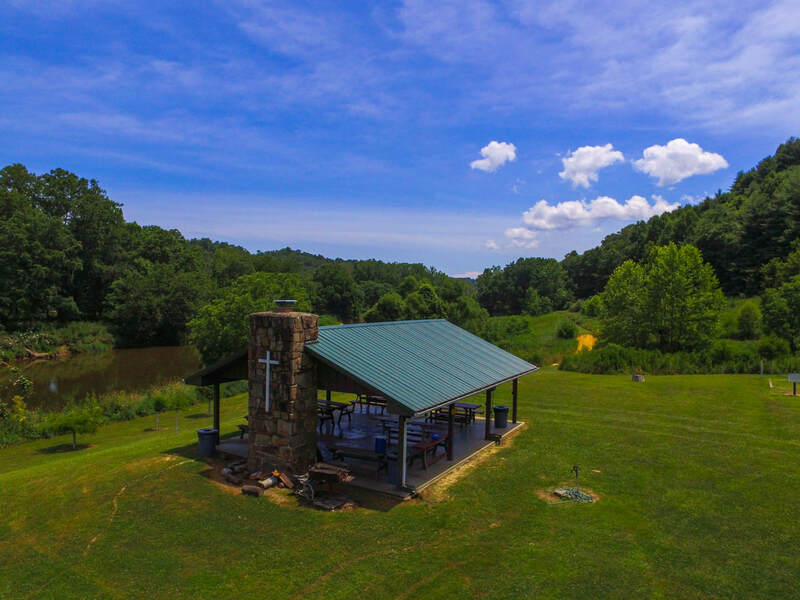 The River Pavilion is located on the edge of our RV park, nestled quietly alongside the bank of the New River and is just a short walk away from our bathhouse. The pavilion houses picnic tables that can be folded into benches and it is large enough to hold up to 60 people under its roof. There is a fire place that can be stocked with wood upon request and there is both a children's jungle gym and a horse shoe tossing pit nearby. ​Our Lower Vespers is located upon the bank of the New River. It is the perfect location for outdoor worship and quiet reflection. There is a fire pit that can be stocked with wood upon request and bench seating for up to 100 persons.